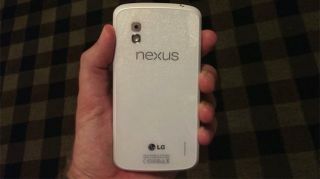 Did a white Nexus 4 with Android 4.3 hide out at Google IO? Google's opening day the IO keynote was heavy on the dev news and upgrades yet light on major announcements, and pushed hardware to the back burner in a rather intriguing fashion. Yet there may be a bit of kit hiding in the Moscone Center's halls, an alternately hued handset we could see launch as soon as next month. According to Android and Me, the rumored white Nexus 4 was more than just a keynote no-show at this year's conference, appearing behind the scenes as a clone of the current version yet in an alabaster shell. How does the site know? Because Taylor Wimberly, the publication's founder, claims he laid hands on the glittery gadget. In Wimberly's words, the phone is a "carbon copy" of the black model, and will arrive on the Google Play Store June 10 with Android 4.3 on board. We know, that's a lot to take in. What little there is to know about Android 4.3 indicates it won't be an earth-shattering update, but it should bring Bluetooth Low Energy support. It may also support OpenGL for Embedded Systems 3.0, shepherding advanced graphics capabilities along with it. Google apparently scrapped 4.3 from its keynote in favor of showing off its ability to introduce new services and APIs without bumping up Android firmware, a perspective courtesy of Android and Me's Google sources. We did get Google's Galaxy 4 running stock Android 4.2, so perhaps we're in for some more Nexus news before mid-year.